Pioneers in the industry, we offer vintage kantha ottomans, embroidered mirror worked ottoman, bohemian patchwork ottoman and handmade kantha pouf from India. 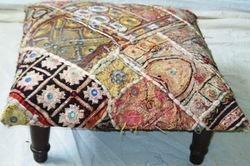 Our firm is engaged in providing our clients a comprehensive collection of Vintage Kantha Ottomans. We make use of high grade raw materials and advanced technology for manufacturing these. Our vintage range is made available in a variety of sizes and colors. They may have considerable amount of patches and imperfections as they are vintage products but their quality standards certainly overshadow that. We offer these at competitive rates. We are looking for export inquiries from Japan, Australia etc. Vishal Handicrafts presents Embroidered Mirror Worked Ottoman in handcrafted bohemian embroidered fabric patchwork in various colors and patterns. Incredible home textiles furnishing with or without cotton filling. We offer sampling pack as per details below. For shipping charges, please email us with name of city, country. We are looking for export inquiries from Japan, Australia etc. 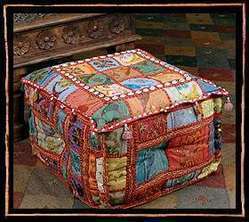 Vishal Handicrafts presents Bohemian Patchwork Ottoman in handcrafted bohemian embroidered fabric patchwork in various colors and patterns. Incredible home textiles furnishing with or without cotton filling. We offer sampling pack as per details below. For shipping charges, please email us with name of city, country. We are looking for export inquiries from Japan, Australia etc. 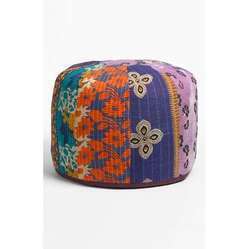 Handmade Kantha Pouf is exotic and ethnic cushion covers are hand double thread work which is a very hard work multicolor handcrafted ottoman puff or stool or chair. these are authentic styles Beautiful ottoman studded with heavy embroidery, In this cover vintage patches from old valuable wedding saris & dresses are patched. We are looking for export inquiries from Japan, Australia etc.